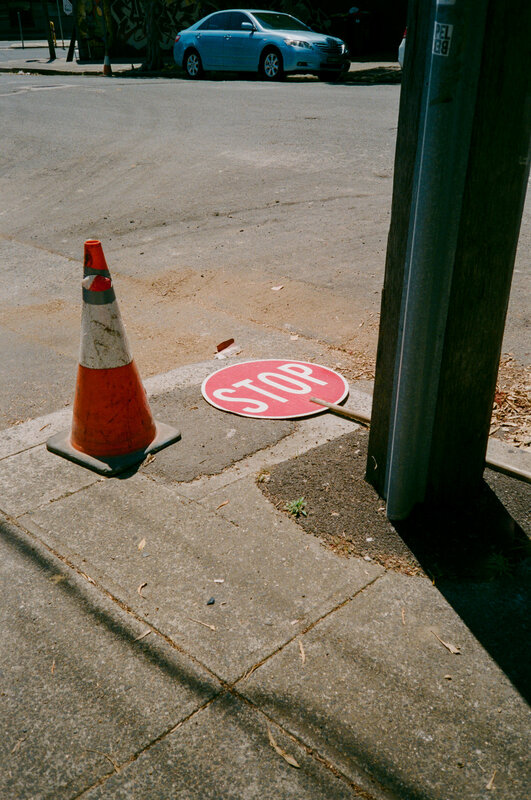 A Soft Collective was fortunate enough to speak to Sydney-based photographer Kim Phan about their obsession with documenting curbside objects which has become an almost ritualistic side project and a charming acknowledgment to the everyday. Kim took some time out from exploring Gabrielle's beloved motherland to have a chat. Hello Kim! Where in the world are you at the moment? Hello pals, I’m in Queenstown at the moment, but I’m headed here and there around the South Island this coming week. Just for a little family holiday, I can’t wait to come back and see the North Island too. It’s a real swell chance to take more landscape snappos, which I haven’t taken in a very long time! Yes! We noticed that you had posted some more landscape stories on Instagram recently and wondered if you'd point your camera back to the landscape while you’re away! Speaking of cameras, we must ask, how did you enter the realm of film photography? I actually distinctly remember hating photography so so much in my first year at university. I don’t know what it was but maybe a combo of hating lugging a huge lens and body around and having little patience for the editing process, it was never for me. One year though I dug a Pentax K1000 out of my parent’s garage and just started toting it on hikes and holidays, it was novel and new way of seeing the world I’d never experienced before. That is such an incredible way to stumble into the medium! We both agree that this photograph is a personal favourite of ours. It’s an incredible example of how you push the boundaries of a portrait. We don’t know what draws us in more, the striking horseman or the foggy mountain ranges in the distance. Ohhh the Horsemen at Bromo! I have a few more snaps from that day squirrelled away for something special. It was my first experience of feeling really compelled to shoot more of a documentary-style series. Oh we're very keen to see this docuseries! On the topic of documentation, where did the fascination or perhaps even curiosity for documenting somewhat inanimate objects, most of which encapsulate an element of personification come from? Oh boy! Sydney Junk-o-rama! I think it began as a sort of obsession with these constantly changing scenes of the everyday. At the beginning it was cranes, I loooved shooting cranes. I was obsessed with how quickly they popped up, how things around them grew, and at any minute they would disappear. It got to the point where people were sending me photographs of cranes they’d see overseas. I think after that I moved to a new suburb, found myself walking around a lot more, and just really enamored by these odd curb-side arrangements. 'Kerb-side arrangements', that nails the intriguing haphazard objects with such quirky personalities you capture so well on film! Thank-you! I think 'personality' is a funny word to use because now that I think about it, they really do have their strange lil stories. It’s odd, I think we live in a world of constant chaos and consumption and disposal it literally spills into the streets, there’s a beauty in it all I guess? Absolutely! What prompts you to photograph one object or a cluster of objects over another that you pass by amongst all the chaos? Hahaha UHM honestly, I catch ‘em all, there are hordes of trash photos of trash, I’m still dealing with that disconnect between turning a mind/eye image into an emulsion/photo image but you know, we’re all learning. When you shot this beautifully backlit photo of the trolley, the first reaction we had to it was that we actually felt sorry for it, it looked lovely but lonely and that comes down to skill refined by shooting regularly! On that journey though, I like the idea of an object and its relationship to its surrounding. Whether it’s compositional or lighting or more to do with a plausible story about how something ended up where I discover it or where it used to be. I also consider how to best convey those things to someone who isn’t standing there right at that moment, running late because they’re walking circles around a trash pile? Hahaha we can actually relate to this, roadside pick-ups feel like an all you can eat buffet where no-ones watching me gorge and more! I think regardless of whether you’re living in a busy city or in the leafy burbs, photos of a lonely object; something from our every day, left to fade into the background of our lives is something that really resonates with your audience. Yeah! I think — though cheesy — art is about empathy, life is about empathy, the world is wild but stopping every now and then and feeling sorry for a lost trolley is a way of slowing it all down. That's the beauty of film too. The relationship between the medium you use to document these objects, frozen in time is extremely successful. There’s certainly a magnetic attraction between the two. Oh definitely! It’s a bit dramatic for me to say but if I didn’t have film to shoot, in say some apocalyptic hell-scape, I don’t know if I’d shoot much at all. That’s wild, but it makes sense. I think film forces us to slow down. Whether we care too or not. It's a kind of therapy that manages to let you see what you've been too busy unseeing in the whirlwind of the daily grind. Are you similar in that respect? I highly agree! In regards to junky streetscapes and film, I think there’s a shared sense of ephemerality between the two, those abandoned objects are probably gone long before I’ll relive that moment again when the scans are back from the lab. Thinking of abandon, do you see a line between the waste itself and say its documentation? The object served its purpose, was disposed off and is now reborn again in film, we take so much, we are constantly consuming and yet this is your opportunity to give something back. In a weird but beautiful way, it feels like you’re thanking it. Like a visual ode to the once functional, mundane object? Hahaha a tribute to trash, in a way probably! Hey, you know the saying about trash and treasure! But, your work does more than that. It seems to comment on the human condition. It makes the critical viewer consider what we need verses what we think we need and how little we seem to consider the difference between the two. Looking at your photographs prompts us to truly ponder on bigger issues beyond the, at times rather trivial displays of discarded household items on the sidewalk. Absolutely! I guess in respect to what you’re saying before about the whirlwind of the daily grind, that moment of stopping and seeing, and snapping is a kind of brief meditation? To me, it’s definitely a change of pace and I appreciate that shooting objects instills a slowness in contrast to my other sort of interests in street photography, where the world seems to slow down for no-one. We love and can see that respect for a slower pace in your work. And on that note, we probably shouldn’t keep you any longer from soaking up and photographing every square inch of New Zealand!